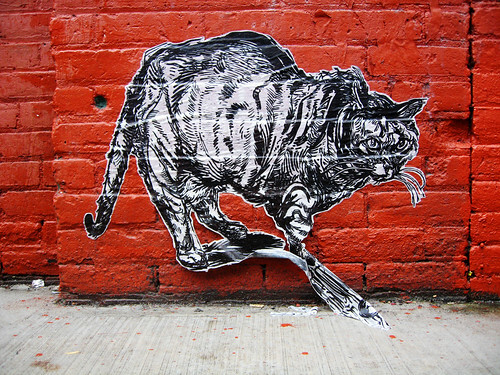 Elbow-toe paste-up of a cat. Photo by Jake Dobkin. Eiffel Tower proposed modifications not for real. The Farnsworth House in Second Life. Citroën’s new Paris showroom, by Manuelle Gautrand. River art by Eduardo Srur in São Paulo. More here. In related news: Sales appear to be holding up. In the studio with Kathy Grayson. In a related story: Denver plans art biennial for 2010. Hitler once owned a painting by Lucas Cranach the Elder that now hangs in London’s National Gallery. The last thing we need is Rudy Giuliani. Today, I’m Feeling Peruvian: A little vintage Chabuca Granda to fill your morning. Spencer Tunick: Nekkid people at the Four Seasons. Frackin’ awesome graff of the day: Yar in Houston. Yo! MTV Raps making a comeback. You and Pink Tentacle are both my heroes. Fetish: The new X-Files movie.